The Canberra Linux Users Group (CLUG) meets on the 4th Thursday of every month in room N101, on the ground floor of the Computer Science and Information Technology building at the Australian National University. The meetings start at 7pm. We usually order pizza so come hungry and bring about $6 to cover the cost of your share if you want some. 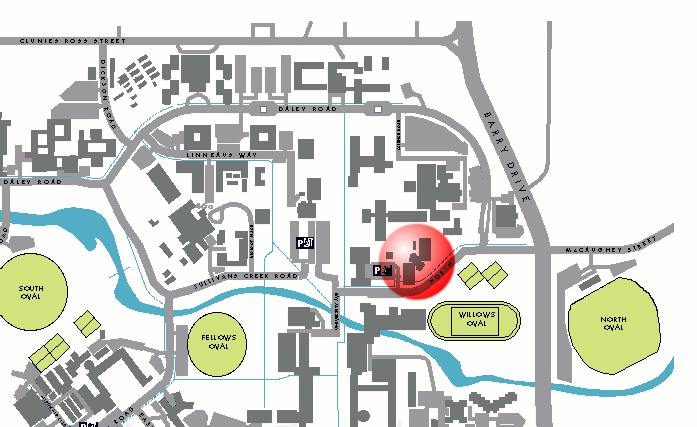 See the map below if you don't know how to get to N101. There is no membership fee and we don't have elections, AGMs and the other stuff normally associated with clubs. Instead people just turn up to enjoy discussing all things related to Linux. There is a mailing list for the discussion of anything to do with Linux in the Canberra area. It is a good idea to join the mailing list if you are going to be attending meetings as any alteration to meeting times etc is announced there. See the projects page for projects that CLUG members have previously worked on. Currently the main contact person for CLUG, or if you have ideas for the next meeting, contact Tony Breeds. For additions and alterations to the web pages, contact Steve Walsh. If you need to send anything to CLUG via snail mail then please email one of the contacts above for address details.